In the spring and summer of 1816, a persistent "dry fog" was observed in parts of the eastern U.S. The fog reddened and dimmed the sunlight, such that sunspots were visible to the naked eye. Neither wind nor rainfall dispersed the "fog". 1800 people froze to death. 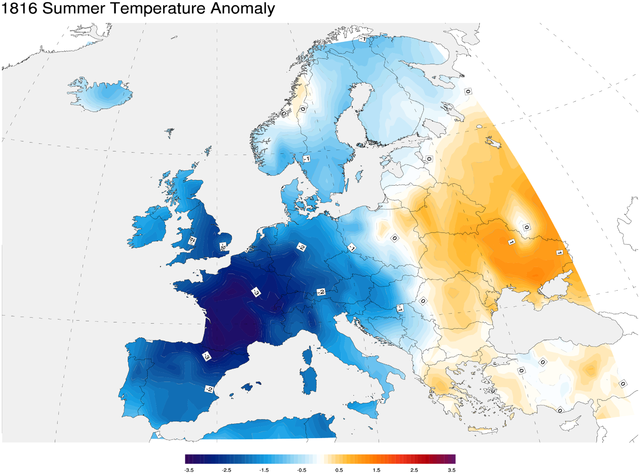 Severe frosts were recorded in June. In the UK families travelled long distances as refugees begging for food. It could be hours away or it could be weeks away, but the Bali governor claims it is imminent and when it blows depending on the size of the eruption, Mount Agung could cause a global cooling, freezing people to death, global crop failures and food shortages across the planet. Global temperatures could decrease by 0.4–0.7 °C (0.7–1.3 °F). This would result in major food shortages across the Northern Hemisphere. The year 1816 is known as the Year Without a Summer also the Poverty Year, the Summer that Never Was, Year There Was No Summer after Mount Tambora erupted in the Dutch East-Indies see Wikipedia link below. An event like this would be a perfect convenient answer to the scientists claiming our planet is too warm, just imagine a decrease of, 0.4–0.7 °C (0.7–1.3 °F) in global temperatures would bring our planet right back into balance regarding global warming. Mount Agung last erupted in 1963, killing about 1,100 people. In 1963, Agung hurled ash as high as 20 kilometres (12 miles) and remained active about a year. Lava travelled 7.5 kilometres (4.7 miles) and ash reached Jakarta, about 1,000 kilometres (620 miles) away. "This is the heaviest test in my life and hopefully it will end soon," said Ketut Suliasih, a Selat villager. She said evacuees are being treated well by the government and community, but like others, she is fearful about the future. "No eruption. That is my prayer. Otherwise, our farms would not be able to be planted again." President Joko "Jokowi" Widodo visited a sports centre serving as temporary accommodation in a district south of the volcano on Tuesday. In a televised news conference, he said "the highest priority is the safety of our people" and urged those around Mount Agung to follow the instructions of authorities. In the Central Java town of Yogyakarta, about 500 people gathered at a Hindu temple to pray for the safety of people near the volcano. They presented traditional offerings and collected money for the evacuees. Bali is the only predominantly Hindu province in Indonesia, the world's most populous Muslim country.